“Home for the Holidays” program seeking volunteers to share their career stories! MESH’s “Home for the Holidays” program, funded in part by Partners for Health Foundation, sponsors housing for college students who experience homelessness when schools close during the winter and summer breaks. Over this past winter break the program covered the cost of housing and meals for 6 homeless college students at Bloomfield College, and it’s currently covering 7 students during the 12 week summer break. MESH is seeking volunteers to share their career stories with students at Bloomfield College. Stories of success and self-determination can help young people build strengths to overcome challenges that they may face. Board member Marybeth Rosenthal and Volunteer Patricia Lowery shared their career stories with college students participating in MESH “Home for the Holidays” program on July 12th. 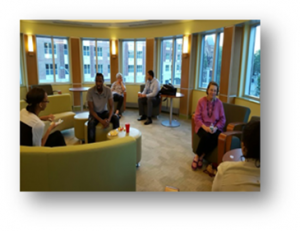 If you would like to share your career story, please join us for a MESH Career Conversation at Bloomfield College (July 26, August 9, or August 23). To learn more call Gwen Parker Ames at (862) 621-9488 or email moc.o1555776694ohay@1555776694nisia1555776694pgrd1555776694. MESH began as an ad hoc organization in winter 2005 when the Reverend Canon Wade Renn, an Episcopal Priest and former Interim Pastor of St. Luke’s Episcopal Church, began thinking of colder days ahead as temperatures began to drop. As he toured Montclair, he noticed where some people slept – huddled in doorways, curled up on benches and vulnerable to the harsh winter elements. MESH continues to pursue its mission as a local, faith-based organization dedicated to engaging the community to provide basic and essential services to Montclair’s most vulnerable homeless adults.